Preamble: This report includes a brief introduction to ITASE, US ITASE Phase 1 (1999-2003) and details of the first portion (2006-2007) of Phase 2 US ITASE. Previous US ITASE Annual Field Reports (1999-2000, 2000-2001, 2001-2002, 2002-2003) describing logistics and science are available at (Field Reports on this web site). In this report we provide the first combined US ITASE and RPSC annual field report in the hope that this form of reporting will enhance communication between US ITASE and components of RPSC that provide logistic support to US ITASE. US ITASE is foremost a scientific endeavor that seeks to collect the highest quality scientific data under the safest and most efficient conditions possible. It has been operating successfully as a traverse platform since 1999 and as of 2007-08 will be entering its 6th field season. The lessons learned over this period are no doubt similar to those emanating from other remote scientific field operations, but they are nonetheless well worth reiterating. These lessons are listed below in addition to the application of these lessons to planning for the 2007-08 field season. Details pertinent to these defining principles appear throughout the remainder of the report. Design and implementation of logistic operations must be undertaken by an open-minded, responsive group of experienced individuals (NSF, scientists, RPSC) with greatest consideration given to those who will actually be in the field utilizing the platform. Application: It is essential that US ITASE scientists serve as the primary organizers for 2007-08 logistics and science and that US ITASE be assigned RPSC support that responds to US ITASE science requests. All planning for 2007-08 will be initiated at a meeting to be held at OPP during April or May of 2007. Regular updates and deliverables will be required from RPSC. Traverse platforms should be built in modular design modes (eg., systems for 4-6 people) that can serve as stand alone platforms or can be duplicated to support larger teams. Application: The US ITASE platform was designed and constructed season by season without the ability to enact a modular plan. For 2007-08 this process will continue, but for the future there are more efficient forms of operation that should be considered. Traverse platforms should be built in McMurdo and easily transportable by C130 without further modification and shelters (berthing, kitchen, science) should be designed of lightweight materials. Application: US ITASE was built on site using primarily materials available in McMurdo, hence heavy on site built wooden structures. It is not possible to rectify this situation for 2007-08 but these issues should be considered for the future. Platform components (vehicles, shelters) should be designed for maximum fuel, storage, and use efficiency (eg., well-planned built-ins for storage of food, fuel, safety, personal, and scientific gear with well planned spares either on traverse or in McMurdo). Application: US ITASE has successfully operated with Challenger 55s, heavy sleds, and heavy shelters but they could be better designed for the future and a more comprehensive set of spares (eg., hitches for sleds, hydraulic hoses for vehicles) should be available. Clear knowledge of the type and availability of aircraft support to traverse teams is essential. C130s are best suited to initial platform installation in the field as well as air drops for fuel. Twin Otters and Baslers provide considerable flexibility for resupply of food, fuel, and breakdown resupply plus retrograde of scientific samples and empty fuel drums. Application: US ITASE Phase 2 benefited greatly from the availability of Twin Otter/Basler support. Platform close-out in 2006-07 was accomplished solely by TO/Basler and it is expected that 2007-08 put-in, resupply, and take out can also be entirely supported by TO/Basler. Traverse teams have always been comprised of highly knowledgeable and experienced scientific and RPSC staff. The science and RPSC members of US ITASE must operate as a team sharing where reasonable traverse responsibilities (eg., driving, water preparation, packing). Application: It is essential that the US ITASE team be given the authority to undertake traverse activities with sufficient flexibility to make in field decisions (eg., sled configurations, in field repairs). For 2007-08 US ITASE all members are expected to be involved in start-up and pull-out. Traverse communications and team leadership are essential components to the safe, efficient, scientifically successful, and enjoyable experience expected from field research in remote environments. Application: US ITASE science PIs will provide leadership for the traverse and will be the primary contact for all communications with NSF and RPSC. ITASE is a multi-national (20 nations), multi-disciplinary field research program with the broad aim of understanding the recent environmental history of Antarctica and the Southern Ocean). Primary emphasis is placed on collecting records covering the last ca. 200 to 1000 years of past climate over Antarctica (Fig. 1) to allow examination of the modern anthropogenic era plus at least the previous 100 years of naturally forced climate.We conduct our research at selected sites to include the two most recent analogs for cold and warm climates, the Little Ice Age and the Medieval Warm Period, respectively. ITASE evolved from discussions between representatives from several national ice coring programs during a meeting hosted by the European Science Foundation in Grenoble, France in 1990. Twelve nations formulated the original concept (Australia, Canada, China, France, Italy, Germany, Japan, Russia, Sweden, Switzerland, the United Kingdom and the United States) at the suggestion of the US representative to that meeting (P. Mayewski). Scientists from Belgium, Brazil, Chile, Canada, India, Korea, New Zealand and Norway have since joined the program. ITASE was formally accepted in 1991 by the overarching international committee for Antarctic research, the Scientific Committee on Antarctic Research (SCAR), as one of its primary initiatives. ITASE is officially recognized as a Scientific Program Group. It was adopted as an IGBP (International Geosphere-Biosphere Program) Project in 1993. The SCAR ITASE Project Office is located at the University of Maine along with the US ITASE Scientific Management Office. Since the initiation of ITASE, several international workshops have been held for purposes of organization and data interpretation. One of these workshops led to the development of an international Science and Implementation Plan for ITASE (Mayewski and Goodwin, 1997, see www.climatechange.umaine.edu). Other international workshops have taken place in Durham, New Hampshire (1999), Potsdam, Germany (2002), Milan, Italy (2003), Bremen, Germany (2005), and Hobart, Tasmania (2006). These workshops have provided important venues for data sharing, concept development, preparation of joint publications, and coordinated logistics planning. years (at sub-annual scale) from ice cores to thousands of years from geophysical techniques. causes of variability in firn stratigraphy including the effects of ice speed, wind and topography. The results of many of these projects are contained in peer-reviewed papers in a dedicated special volume of Annals of Glaciology (volume 41) plus in several other journals. In addition to the foregoing US ITASE and ITASE have been instrumental in producing a document entitled: State of the Antarctic and Southern Ocean Climate System (SASOCS) prepared for the Antarctica and the Global Climate System committee of SCAR. This document provides a basis for assessing and understanding future climate change over Antarctica and the Southern Ocean and will be released over the next few months. With the completion of the 2002-2003 field season, US ITASE accomplished the following technical and logistical activities: (1) the traverse traveled a total of ca. 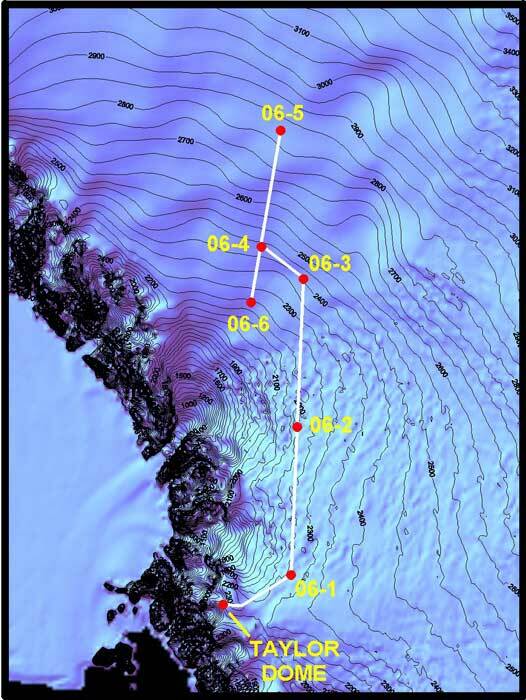 5500 km sampling a significant portion of West Antarctica, (2) continuous radar observations (crevasse detection; 400 MHz) and shallow depth (firn stratigraphy; 400 MHz) over the ca. 5500 km of the traverse route and deep (ice stratigraphy and bedrock; 3 MHz) over ca. 3500 km, (3) twenty science sites occupied for periods of 2-6 days depending upon workload per site, (4) a total of ca. 3100 m of ice core recovered utilizing both the 3” diameter Eclipse drill purchased by NSF for use by US ITASE and a 2.2” diameter lightweight drill built by Glacier Data for the University of Maine for analyses of major chemistry, isotopes and trace chemistry at several sites, (5) permeability and porosity experiments conducted from 15 snowpits and qty 12, 18-m ice cores, (6) stratigraphy sampled at all sites utilizing snowpits excavated either exclusively for this purpose, or snowpits excavated as access for 3 ice coring, or ca. 10 m wide pits excavated using a Challenger 55, (7) ninety days of atmospheric and shallow chemistry observations conducted at twenty sites, (8) real-time, continuous near-surface observations of peroxides (H2O2 and organic peroxides), formaldehyde and ozone and ozone profiles up to an altitude of 23 km, (8) basic meteorological observations collected at all sites and 10 m depth temperatures for comparison with infrared satellite estimates of mean annual temperature, (9) twenty-five high precision GPS	‘coffee can’ experiments deployed to estimate mass balance, and (10) three AWSs deployed close to the inland deep drilling WAIS site. US ITASE Phase 2 is a continuation of US ITASE Phase 1, with field research conducted in the same manner of traversing, stopping for cores and to perform science experiments. (approximately three-four days per coring site and 1-2 days travel between sites, depending on distance to be covered, were planned). As before, sites are preplanned, and then subject to change depending on on-site radar results. 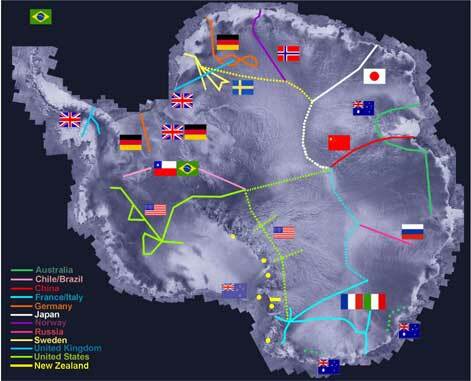 The major differences are that the traverses are conducted in East Antarctica instead of West Antarctica, the traverses are planned for two years instead of four, and the traverse will follow a continuous route from Taylor Dome to South Pole Station. A start at Taylor Dome was required because of the positioning of US ITASE platform tractors and sleds after the Light Ground Traverse (LGT) from South Pole to Taylor Dome (2003-2004). Prior to the end of the 2002-2003 season many of the PIs submitted	proposals for US ITASE Phase 2, received	reviews, and were encouraged to resubmit proposals with minor modifications and to start planning for US ITASE	Phase 2 by NSF. Funds were received to continue our Science Management Office (SMO) at the University of	Maine. Most PIs received their grants during 2005 and SIPs were completed and submitted by April 2005 and then	resubmitted with modifications in April 2006. During summer, 2006 we were informed by RPSC that the initial	put-in to Taylor Dome for US ITASE preparations would be approximately Oct. 30. We were requested to have all	of our personnel in McMurdo by Nov. 10-15, in expectation of a Nov. 20 put-in. Half of our traverse crew arrived	in McMurdo by Nov. 8, and Welch, Koenig, Kurbatov, Flaherty, and Waszkiewicz arrived at Taylor Dome on Nov	14. The rest of the US ITASE personnel arrived in McMurdo between Nov 16-18 because of flight cancellations	and lost baggage. These remaining personnel were deployed to Taylor Dome on December 4, for reasons explained	below. BrianWelch, co–PI with Robert Jacobel (deep radar, science oversight for put-in portion of season, 4th Antarctic season, Assistant Professor, St. Olaf College). Figure 2: Proposed 2006-2007 US ITASE route. Red dots indicate ice core sites. The US ITASE Phase 2 science planned on the following accomplishments for this first year of the two-year field project. 1315 km of traverse (Figure 2 includes doubling of some legs). 1000 km of shallow radar profiles. 1000 km of deep radar profiles. 7 sites of in situ gamma ray density studies. 7 sites of 35–GHz radar penetration and extinction studies. mentoring of 4 graduate students (2 U. Washington, 2 U. Maine).